Little Gordon Ramsey cracks me up! Should I become more like him when I go to restaurants? This kid has a real future in acting! Love him. I have only had Thai food a couple times in my life. 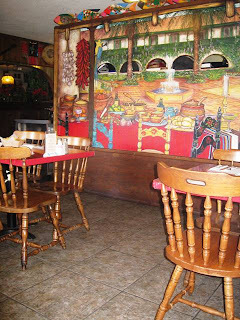 The first time I had it I was a young 20 year old when Villa de Jerez in downtown Hollister was the Thai Restaurant. Does anyone remember when that was there? The second time was in Downtown Salinas before my sister's fashion show. And so I had to make it a third! 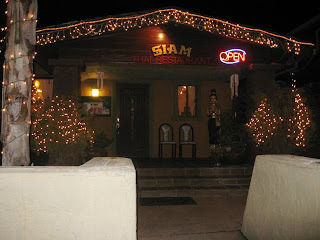 I researched all things Thai food and decided Siam Thai Restaurant located at 17120 Monterey Street in Morgan Hill might do the trick. Out came the soup I ordered: Tom Ka Seafood. The serving dish sure was pretty! 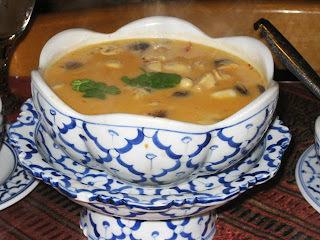 It was a extremely flavorful coconut milk soup with prawns, scallops, calamari, mussels, galangal, mushrooms, fresh lime juice, lemon grass, kaffir lime leaves, cilantro and chili paste! Between two of us we shared the small order and that was plenty. 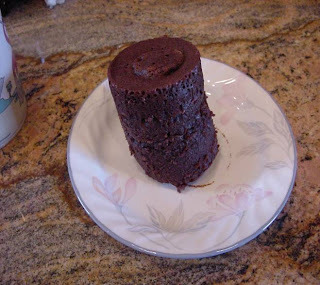 I could only stand a small bowl of this, not because it wasn't good it just was so rich! At first, I didn't think it was spicy but by the bottom of the bowl I was starting to sweat! Next up was the Prig Khing Beef, ordered to be "Medium" on the spice level. Ok, so I learned that Thai translation for Medium = Atomic Hot! Omg. Besides the heat the dish was extremely flavorful. 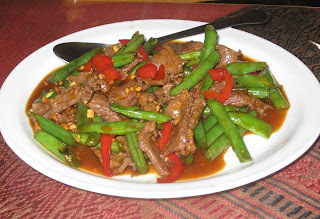 The beef was sauteed with garlic, roasted sweet chili sauce, red curry paste, bell pepper and green beans. Next time, I am thinking MILD! The rice selection was Pineapple Fried Rice. I chose this mostly because it sounded like it would be tasty without scorching my taste buds. The fried rice was a delicious blend of prawns, chicken breast, Chinese sausage, garlic, onions, broccoli, tofu, raisins, cashews and pineapple. What a treat! I would definitely order this dish again. A meal in itself! All in all my Thai experience was an educational one. I learned that I cannot tolerate spice like I used to! I used to be able to handle any kind of heat, now not so. 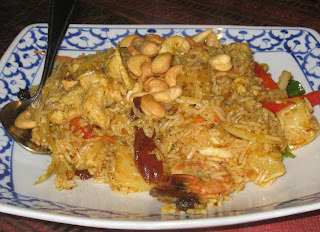 The Pineapple Fried Rice was a treat, a recommended order to Thai food newbies. 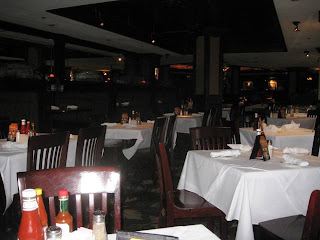 The restaurant seemed like a real favorite - I mean it was packed with people! I would like to return to try out more entrees. In fact they gave me a frequent dinner card with two entrees stamped... the 13th entree is free! That is pretty cool! Melissa Good Taste says 1.75 thumbs up. Kind of obsessed with Wraps! I don't really like breakfast when I wake up in the morning. My breakfast usually consists of coffee and by 10:30am I am ravenous! So, I decided to try bringing a wrap with me to work... What a great idea that has been! 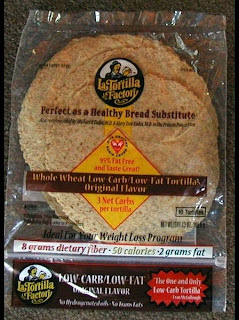 I start with a Low Carb, Whole Wheat Tortilla - I found these at Trader Joe's. 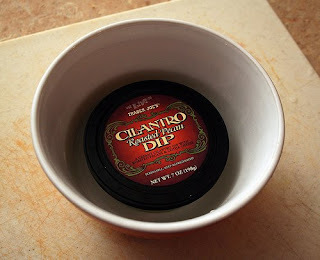 Next, is a dip I also found at Trader Joe's - Cilantro Pecan Dip. Woweeeee! This is fantastic stuff. Tastes like a vacation in an exotic location in a little plastic tub. That good! Schmear a healthy spoonful to the tortilla. 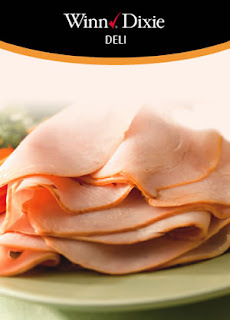 I needed to add some protein so I decided to add some deli turkey slices. I am sure chicken would be just as delish. 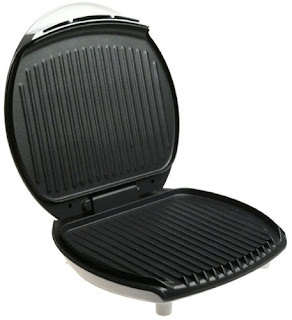 And this is the most important part... throw the wrapped up goodness on the George Foreman and let the grill make its marks. I wrap my heated up tortilla in tin foil and bring it with me to work! Try it! Sooooo good! I tried left over pot roast, flanked with sour cream and horseradish on Saturday and that was wonderful. But, now I want to experiment with other combinations! I bought some more trial ingredients to try out with the wraps this week. They include: Pumpkin Butter, Cashew Butter, Hummus, Fire Roasted Salsa, Sun Dried Tomatoes and a variety of cheeses... not all to be tried together! 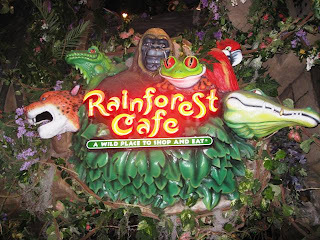 Why was I so excited about eating here? 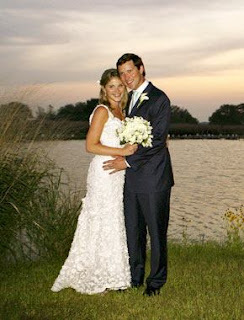 Well because the beautiful Jenna Bush had her rehearsal dinner here the day before her wedding at her family ranch in Crawford, Texas! 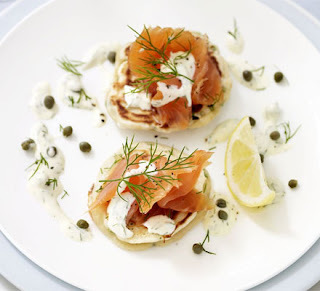 I ordered the Range House Smoked Salmon and Corn Pancakes with Chive Creme Fraiche along side a cup of Sweet Potato Puree Soup. Yummo! 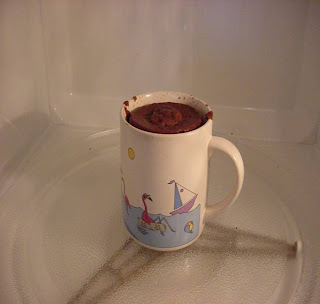 The soup was very comforting. It was a cool night and really warmed my soul. The Salmon was delish. Light enough to not weigh you down, and the pancake hefty enough to fill you up. Does that make sense? I hope so, because it makes perfect sense to me! 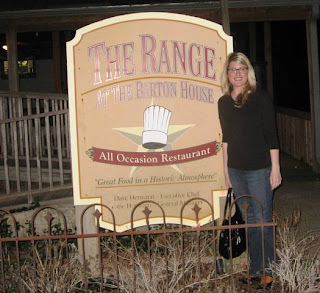 The Range offers authentic gourmet dining in a Texas historical landmark home built in 1866, and the ambiance is casual yet elegant. 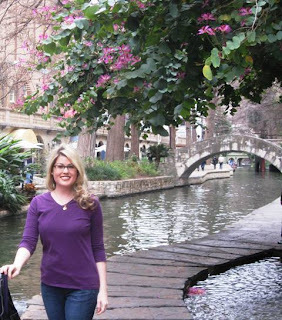 Just a lovely spot full of Texan charm! The dining room was empty but we weren't scared. The menu read amazing and the view from up top was wonderful! 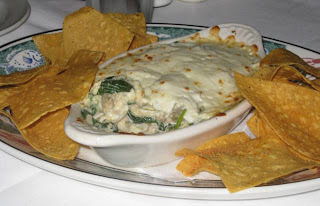 We finally got our Crab Dip! This version was the Crab, Artichoke and Spinach variety! Wahoo - out of this world, bomb diggity delicious! Can you tell I really liked it? 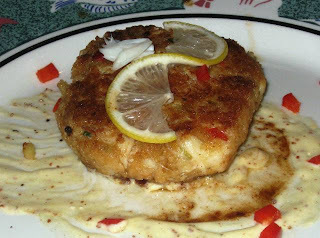 And to round out my meal was a tasty Crab Cake. Large in size and full of lump crab meat. Wahoo! Landry's was a nice little find. 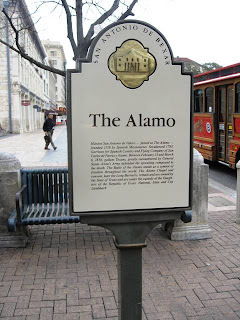 Right on the River Walk and easy access to Crockett Street which is the heart of down town. The menu was jam packed with all things seafood. If you could think of it they had it. 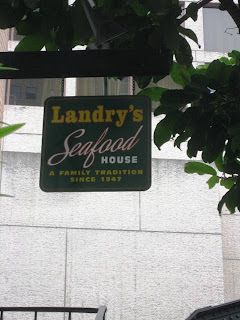 I found Landry’s fancier and slightly more expensive than most restaurants in the area but well worth it. 1.75 thumbs up for a nice meal. 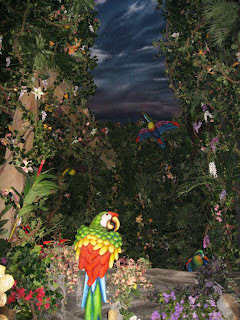 I really wanted to blog this place because it is so cool inside! 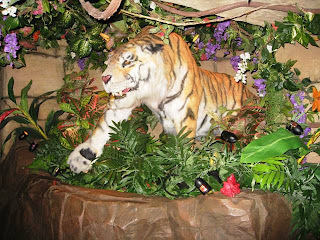 I love the jungle theme. 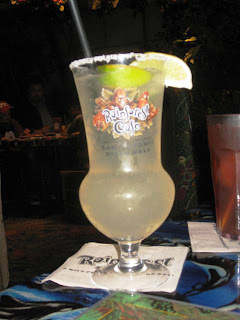 We ordered drinks - the Cheeta Rita. Mrrrrroooooooooowww. They were a tastier version of your standard Margarita. But, when the waiter came back to take our order he said they were all out of crab. So that meant no Crab and Artichoke Dip - booo! 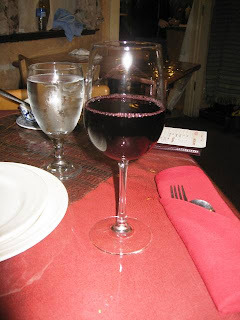 We decided to finish our drinks and try out another restaurant. A place that had a fully stocked kitchen, with all the crab our pretty little hearts desired! Melissa Good Taste was not happy, one thumb up for cool atmosphere and tasty beverage. 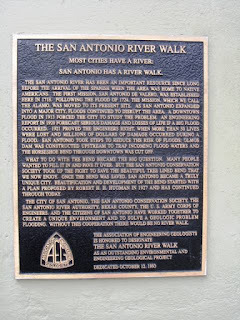 The San Antonio River Walk (also known as Paseo del Río) is a network of walkways along the banks of the San Antonio River, one story beneath downtown San Antonio, Texas. 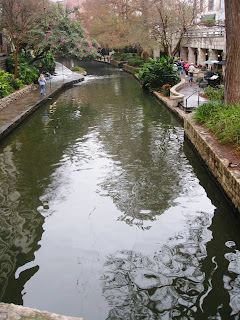 Lined by bars, shops and restaurants, the River Walk is an important part of the city's urban fabric and a tourist attraction in its own right. 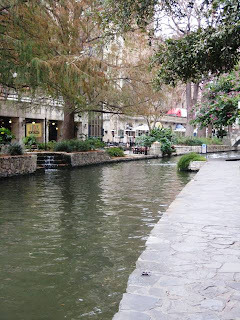 The River Walk was the idea of architect Robert Hugman in the late 1920s. 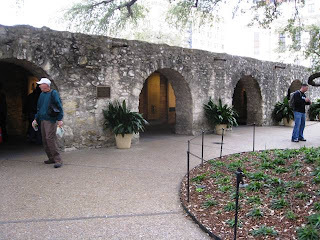 As an alternative to paving over the troublesome San Antonio River, Hugman drew out a plan he called "The Shops of Aragon and Romula" which allowed for both flood prevention and commercial development. Hugman maintained his office along the shallow river, despite warnings that he would be "drowned like a rat" and its early reputation as a dangerous hole. 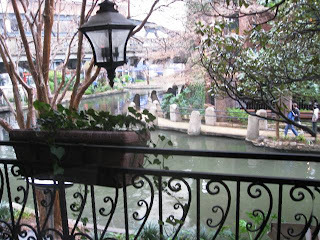 Hugman persisted, and his office can still be found next door to another early presence on the River Walk, the landmark Casa Rio restaurant. Cool huh? 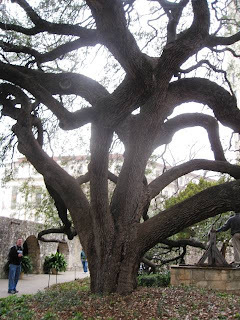 Very pretty and lots of fun places to eat. Food Blogger heaven! 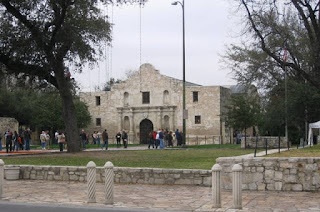 I learned that Texas entered the United States as a result of a treaty between the United States and the Republic of Texas. As a result, Texas is the only state in the United States that can fly its flag at the same level as the United States flag when they are flying side by side. I never knew that! 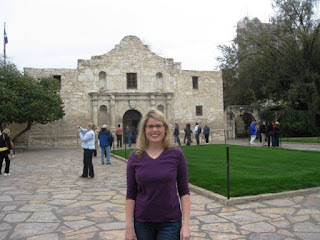 I am off to Texas! 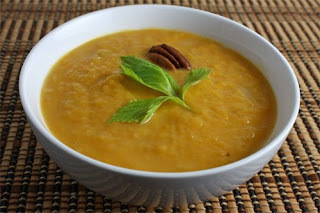 Be back soon - hopefully with lots of foodie posts! I got up and got going Saturday morning and rode both of my horses. Freckles finally is working someone on the ground so he is on the fast track to show time! James saddled up Roddy and I caught Missy, my new horse, and we took them on a trail ride. Those horses have a lot of energy! By the time we unsaddled my brother and I were both starving! And so guess what we both were craving... Mexican food! 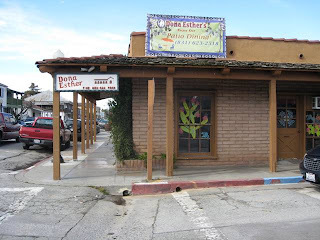 Make your way to 25 Franklin Street in downtown San Juan Bautista. There you will find where I have consistently eaten at least 2 meals a week for the past 20 years. James and I were seated in the dining room to the right and immediately were greeted with a basket of chips and salsa. The chips were fresh and they tasted especially delicious. The salsa is not the best but it definitely does the job. 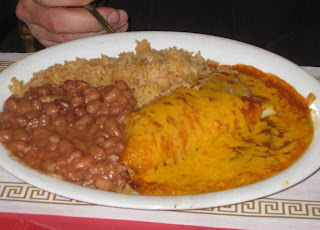 I usually order the same thing every time I go to Dona's - the Shredded Beef Enchilada with extra sauce. For the sake of the blog I decided to branch out and try something new. I have always wanted to try the Lobster Enchilada so I figured today was the perfect day to do it! Doesn't it look amazing? 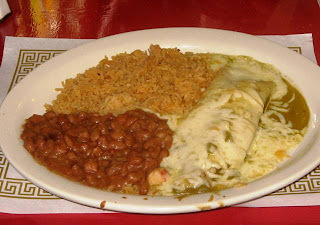 Lobster meat is stuffed in a flour tortilla with Monterey Jack cheese and green sauce served with rice and beans. OMG - it was awesome! I have been truly missing out on this for a long time. My new favorite thing! My brother got the old faithful - Shredded Beef Enchilada and it didn't fail. Always delicious and even came with extra sauce, something my family always requests. Today was a good day. 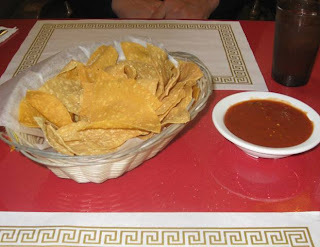 The chips were fresh, salsa decent, our entrees tasted on point and we were in and out within 30 minutes! Great job Dona's! If you have never been to Dona's you need to try a few things, the items we ordered today of course, but the Nachos Supreme and believe it or not the Homemade Pasta Soup really hits the spot! They have a pretty awesome catering business that they do that as well, in fact they do a fabulous job and the food never fails to impress. They have full bar located on the side of the building that serves up some pretty stout Margaritas, along with other potent concoctions. 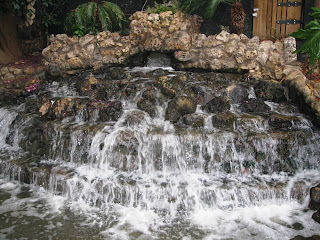 On a sunny day stop by and eat in the outdoor patio and enjoy the beauty of San Juan Bautista. Two thumbs up! 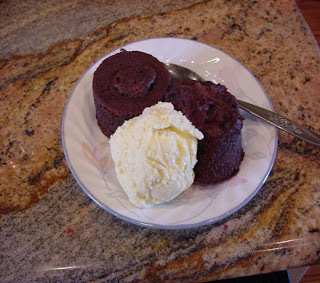 Thanks to my cousin Allison for sending me this recipe! Lets give it a go and see how it stands the true chocolate test! Comments are appreciated if you actually try it out! I went on a house search on my lunch break today and had only about 20 minutes to grab something to eat back at my office. 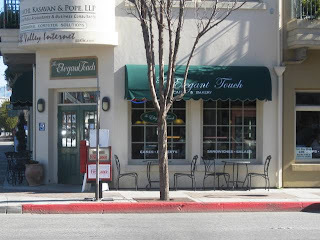 I was driving downtown and decided to pull into The Elegant Touch located at 601-A San Benito Street. I don't normally go to The Elegant Touch for lunch for one reason and that reason only - the lack of available parking! There is bank located on the corner, and there are several other buildings surrounding the restaurant taking up all the available spots! You have to really luck out to find an open parking space around noon time. But, they seem to always have a special and today was no exception. 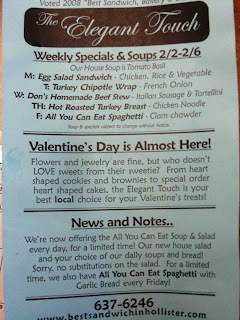 Click on the Photo to read the Weekly Specials! Yum yum - Tomato Basil. I ordered the Half and Half to-go. 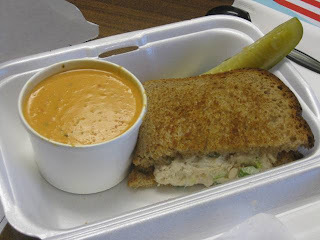 My half sandwich was a Tuna Melt and my half soup was Tomato Basil - available everyday. The sandwich was nothing to write home about, the bread was barely toasted and cheese barely melted. The tuna salad mixture was nice though, it had huge chunks of celery making it a nice crunchy texture. The soup was excellent. Hands down best Tomato Basil I have yet to have anywhere else in Hollister. They included Saltines and a juicy dill pickle in my to-go package, that was really nice! All in all, The Elegant Touch is a fine place to drop in and order your meal, whether you take it to-go or sit and eat in. 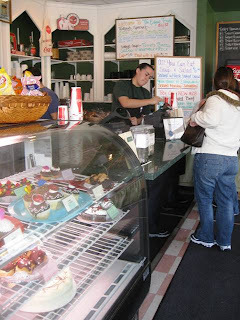 It does tend to be extremely busy during the lunch hour and it fills up in a hurry because there is limited seating. I don't mind that you have to stand in line and order your meal at the counter either, in fact I think it helps you receive your order faster. 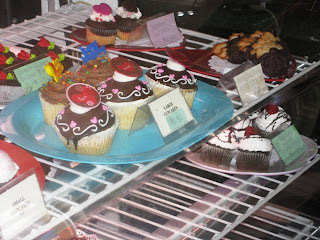 The dessert display is conveniently located where you stand in line where you order - forcing you to drool profusely and then order as many sweets you can get your hands on! 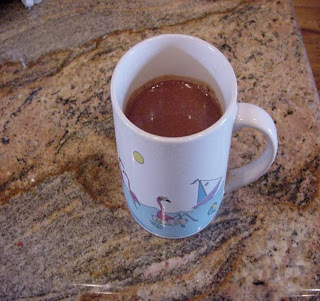 For the price of $7.50 - the Half and Half gave me enough energy to get me through my day, and write this post! 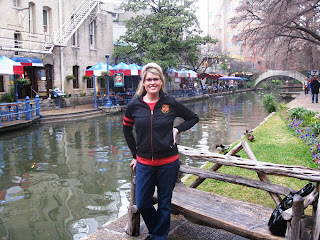 Melissa Good Taste gives it 1.50 thumbs up! 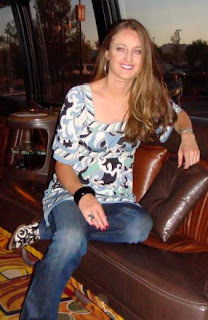 I have been looking at houses and that has been "eating" up my Melissa Good Taste time! The time I have to try new restaurants has been replaced with looking at houses to buy... I have not forgotten about you loyal readers! I will hit you with some new posts soon!